As gaming became more and more popular in arcades, it was inevitable that a racing car games would eventually appear on the scene. The ball started rolling back in 1974 with the release of Nishikado’s Speed Race, a black-and-white racing game that introduced scrolling sprite graphics and featured a steering wheel. Midway released it as Racer in the United States as the game was very basic it was never very popular. A few similar games followed in 1976 with Road Race by Sega and Night Driver by Atari, but none of these seemed to cut the mustard as well. It wasn’t until Pole Position came along that racing games really took off, as it was a great improvement on the games of old. The game came in two forms, a sit-down and upright cabinet. The sit-down cabinet version really did give you the feeling of sitting inside a special F1 racer. 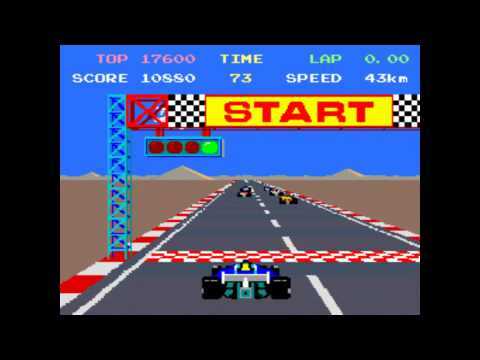 You had a racing steeling wheel, accelerator and brake pedals (accelerator only on upright), a gear stick (two gears only hi-low) and even speakers at the side of where you sat to blast out the sound effects, music and even speech! Designed by Tōru Iwatani, Pole Position was just one of his classic titles, he was responsible for designing the Gee Bee games and is most famous for creating Pac-Man. Released by Namco and licensed to Atari, Inc back in 1982, Pole Position was way ahead of its time, being one of the first 3D racing video game to feature a track based on a real racing circuit, the ‘Fuji Racetrack’. Although the track is named the ‘Namco Speedway’ in the game, the game also features Mount Fuji in the background during game play. The game gave you quite a lot for your 10p credit as firstly you had a qualifying stage. This consisted of racing against seven other CPU drivers for one lap to generate you grid position for the main race. 8th place : 200 points. In the main event, you are now racing against the clock that has a countdown of two minutes. Just like the qualifying lap, it is imperative that you avoid all the obstacles that you will encounter in order to complete the race. 1) Avoid puddles and the sides of the track because these slow you down. 2) Accelerate before the green light appears, and stay ahead of other racers. 3) Drive to the inside of the track to make the corners. 4) Successful completion of a turn depends on braking skill. 5) Engine sound will cue the driver when to shift to high gear. 6) When sliding, steer into the skid. At the end of the game, 50 points are scored for each car the driver passed. Finishing the game awards 200 points for each second left on the timer. It was rumoured that instead of pressing down on the accelerator pedal, placing your foot underneath and lifting the pedal up caused the car to go even faster! Pole Position was way ahead of it time, introducing some groundbreaking features within the game. It was one of the first games to have product advertising on billboards around a track. In real life motorsport, prominent sponsor companies such as Marlboro, Gulf and Martini & Rossi were used. However, these were thought to be inappropriate for a game that children could have access to, so the sponsors were changed. In the Namco arcade version, Pepsi and Canon were used and in the Atari home version Centipede, Dig Dug, Dentyene and 7-Eleven. With the games success, it wasn’t long until Pole Positon was ported to a number of home consoles and computers that started to appear. These were the Commodore Vic 20 & 64, the Sinclair Spectrum, the Atari 2600, 5200, 7800 (Pole Position 2 only on the 7800) & 800/800xl. After several years had passed and the game died down. Then a little later, it made a comeback on more modern systems like Sony’s Playstation 1, the Nintendo 64, the Sega Dreamcast, the Nintendo Gamecube, Microsoft’s X Box, and the Nintendo Gameboy Advance. A version of was even released for iPod on January 21, 2008. On September 14, 2008, a version of Pole Position was released for iOS devices called Pole Position: Remix. The game features upgraded graphics and several different control methods, but remains similar in content to the original. It still features the tracks from Pole Position II but has a new track called Misaki Point. 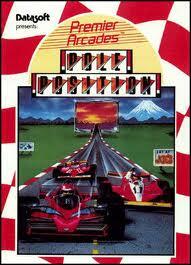 As famous in the arcades as it was, Pole Position also appeared in a couple of films. The game is played by the characters Daryl and Turtle in the motion picture D.A.R.Y.L. and a Pole Position cockpit model appears in the 1983 movie ‘Joysticks’. A Pole Position upright model appeared in the Judas Priest music video ‘Freewheel Burning’, the gameplay shows the head of Rob Halford (lead singer) in the player’s car. Pole position 2 was released in 1983. 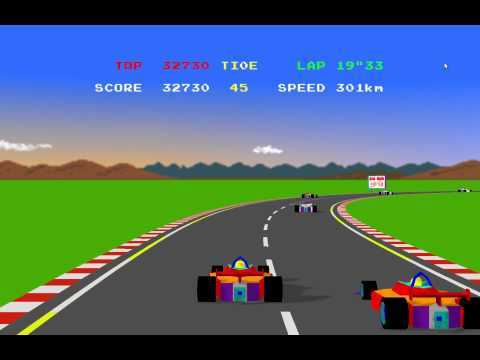 The game play is basically the same as Pole Position but with slightly improved graphics and sounds. A new opening screen and several new billboards have been introduced and features like cities and pyramids have been included in the background when racing. The race cars have been slightly up-dated with some new colour schemes and debris now shown flying through the air when the cars collide with an object and explode. The sounds have been improved in the game with a new opening theme and the cars sound a little more throaty making them sound more powerful. The game now features three more race tracks to choose from. The Fuji racetrack is still available along with Test (resembling Indianapolis Motor Speedway), Seaside (resembling the 1982 United States Grand Prix West circuit in Long Beach) and Suzuka. One notable difference between the Japanese and American versions is that while the timer is displayed as “TIME” in the Japanese version (as it was in the original game), it is displayed as “UNIT” in the American version; the reason behind this is unknown. Even today creators are still trying to give player a modern take on this classic game, this is called Project ‘ppengine’ which was sadly never finished! By 1983, Pole Position had become the highest-grossing arcade game that year in North America, where it had sold over 21,000 machines for $61 million, ($149 million in 2015), along with $450 ($1100 in 2015) weekly revenues per machine. Pole Position is regarded as one of the most influential video games of all time and arguably the most important racing game ever made. To this day Les Lagier, is the world record holder on Pole Position 1 with an impressive 1984, 67,310 points and I can’t see that being beat anytime soon. And the sad thing is that this project ppengine was never finsihed. They abandoned it.